Three Bangor University students will be sharing the fruits of their research at the University’s Archive at an open event on Wednesday 18 November. The three were chosen by the Archive, part of the University’s Library & Archive Service, as part of a National campaign across the UK, “Archwiliwch eich Archif / Explore your Archive”, which is raising awareness of the amazing archive collections to be found across the Country. 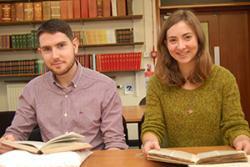 Elen Wyn and Siôn Edwards busy researching in the University's ArchiveElen Wyn, Siôn Edward Jones and Meinir Olwen Williams were selected to prepare a presentation based on new research in the Archive, following a grant awarded by the Welsh Government. They will be discussing their research into the National Eisteddfod held in Bangor in 1915, folk tunes and nineteenth century travellers and tourists to north Wales. Elen Ifan of Rhoose, Glamorgan, is studying the poet T Gwynn Jones for her PhD at the School of Welsh. Siôn Edward Jones from Tal-y-llyn Meirionnydd, but who now lives in Star, Anglesey is a postgraduate student. He is about to complete his third year of research in to “Anti-clericalism and the “Dissenting conscience” in Wales 1789-1985 with special attention to the Tithe” under Dr Lowri Rees’ supervision at the School of History, Welsh History & Archaeology. He chose to look into nineteenth century travellers and tourism. “The experience of browsing through the manuscripts relating to travellers and tourism to north Wales was worthwhile. Who knew that sons of the King of Siam borrowed Lord Penrhyn’s steam boat for a pleasure cruise up the Menai Strait in 1898? Or that the argumentative keeper of Caernarfon castle lost his job in 1851? These are some of the pearls anyone can discover here in the University Archive. The public can come and hear about the research projects at two sessions in the afternoon - one in Welsh between 2.00 and 3.00 and one in English between 3.15 and 4.15. All are welcome to attend. Places can be booked by contacting the Archive on (01248) 383276.